If I have a favourite sweet, it would have to be rasgoola. 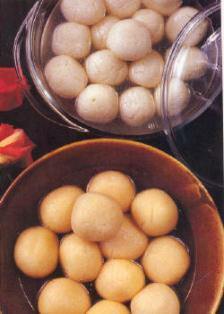 Juicy, firm yet spongy, squeaky confections made from fresh panir cheese simmered in sugar syrup – irresistible! I was thinking fondly of the giant rasgoola obtainable as maha-prasadam in Sri Mayapur, West Bengal (home of the rasgoola) when I received this letter the other day. Hi Vicki, thanks for your letter. On the contrary, rasagoola are a high-class Bengali sweet that are, in my opinion, one of the best examples of the amazing things that one can do with fresh panir cheese. Panir is in fact rather expensive in India, so they are as expensive if not more expensive than gulab jamuns. However they are rather tricky to make. Once you have tasted real rasgoola in Bengal, none other will satisfy. They should be spongy, firm and soft at the same time, and should squeak when eaten, exploding their juices in the mouth. Better than gulsb jamuns, in my opinion. Here’s a wonderful rasgoola recipe, by world-famous author and chef Yamuna Devi.